Siyata Mobile (SIM:TSXv; SYATF:OTCQX) holds the key to unlock literally billions of dollars in annual airtime and data plan charges for Verizon, Sprint, AT&T in the US and Bell, TELUS and Rogers in Canada. And to Motorola, I figure Siyata is worth some $14 billion in revenue and US$6.3 billion in gross profit on their 4G rollout (and that’s just the US & Canada!). I’ll explain how this $50 million microcap already controls that $14 billion market – it’s a massive investor win hiding in plain sight. These cel phone companies – and Motorola – have market caps well into the billions of dollars. Any of these huge companies could pay three, four or five times Siyata’s current share price for the company without batting an eye. A few hundred million is a rounding error for these giant businesses. For cel phone companies, the key to winning those billions of dollars of airtime charges is getting the only certified 4G phone for push-to-talk–Siyata’s–into their customers’ trucks ASAP. For Motorola, the key to not being completely shut out of this $12-14 billion hardware market is tieing up Siyata ASAP. I own hundreds of thousands of Siyata shares personally. I think it has the chance to be the fastest multi-bagger I’ve ever put into my portfolio. And I think that the incubation period for this trade to work out will be measured in months not years. Siyata has guided for 50% revenue growth in 2019. I believe that is conservative and that a double is much more likely. Valuing a business growing this fast isn’t rocket science. These companies trade at 5-10x revenue, depending on the Market’s confidence in rising revenues. Simple math tells me that 5 times revenue (just assuming 50 percent revenue growth) for this company will mean a $200 million market cap next year… and again that is using the conservative revenue view. How is this company priced by the market today? With a market cap of just $50 million…with conservative valuation and growth assumptions…the numbers point to this as a potential 5 bagger within 12 months! After 80 Years There Is Finally A Better Solution! I explained in Monday’s article how – for 80 years – Land-Mobile-Radio (LMR or “push-to-talk”) has been the standard method of communication for users in vehicles or on foot. And that was fine, but there were limitations. Motorola’s push-to-talk product is inconvenient for users; they must use several devices, which obviously costs a lot of money. That’s two strikes. 4G technology allows a better solution – because it provides enough bandwidth to allow push-to-talk to finally work over a cellular network. This is an almost impossible challenge to Motorola’s monopoly in the push-to-talk service. The way I see it, 4G hasn’t just created competition for Motorola, it has totally removed the need for Motorola’s legacy push-to-talk product. Motorola’s legacy push-to-talk product is now Blockbuster video, and 4G has introduced us to the new Netflix. This is a huge market–billions of dollars in annual airtime revenue. All of the national cell carriers want as much of it as they can get. And how much they can get depends on how much Siyata hardware they can sell. There are more than 12 million commercial vehicles that need to be upgraded from existing push-to-talk to a 4G network. So where does my little micro-cap, Siyata Mobile, come in? Siyata has the hardware that commercial users will use for push-to-talk. Siyata moves all of the functions of all the previous hardware into one simple device. It’s not only convenient, but saves customers a lot of money. The incredible thing is that Siyata is the only player in this space! Seriously. This is the only company that can provide the dedicated in-vehicle hardware to allow the big cell carriers to tap into the billions of dollars of airtime and data charges. The contracts that Siyata has already signed with the major cell companies is proof of that. That is obviously a lucrative position to be in–a position so good that you need to understand how it could possibly come to be. A brand new $20 billion market is now opening up to the big cell players. That market runs through tiny Siyata Mobile–which holds the hardware solution that will connect the customer to the AT&T, Bell and Verizon’s of the world. Siyata has been the pioneer in providing hardware for push-to-talk over a cellular network. The company has been working on push-to-talk hardware for cell carriers since it was spun-off as the commercial truck division from Accel Telecom in 2011. They’re 7 years ahead of the competition. With 3G capability being so limited, nobody else was interested in this business besides Siyata. The big companies wanted to sell 100 million cell phone devices to consumers, not selling 300,000 truck devices to the small market of a few commercial 3G users. Why would anyone spend time developing hardware when there was virtually no market to sell it into? That’s how Siyata got a 7-year head start on the competition. Now – in the blink of an eye – 4G technology has turned commercial push-to-talk into a market that the big cell companies are interested in. The race is on to capture market share and Siyata has the ONLY hardware ready to exploit it. Without competition, Siyata commands huge profit margins for its product – about 45%. As context, that’s more than double the margin for consumer cel phones that Samsung or LG generate on their hardware. And it is a business that is growing very quickly. 4G capability opens up – actually, it totally disrupts – a 12 million vehicle commercial market. They’ll all move from LMR to cel, and save time and money doing it. It’s a compelling value proposition for the industry. That’s why this move will happen quickly. The low-hanging fruit in this market is the 2 million First Responders in the United States – they are mandated to use FirstNet cellular network funded by the U.S Government. In 2012 US Congress authorized FirstNet (First Responder Network Authority) to develop and operate a nationwide broadband network that equips first responders to save lives and protect U.S. communities. FirstNet has decided it will adopt cellular based push-to-talk technology. Cops don’t have to walk around with two devices, and range won’t be an issue. The First Responder transition is certain and will happen fast. There is 2 million units of low hanging fruit–worth some $2 billion in hardware revenue and some $800 million in annual airtime/data charges for the taking. This will also force the cel phone carriers and Motorola to decide how badly they want to own Siyata. Cel phone companies have not traditionally bought/owned hardware companies. I think this could be different if they could freeze out their competition in this highly lucrative niche market with a high (impossible?) barrier to entry. But for sure, no single company is more motivated by the 4G developments than Motorola Solutions. With the dominant share of LMR, Motorola has the most to lose. Now, Motorola is smart. They have been taking steps to protect this business. In order to do push-to-talk over cellular you must have a software package that is ‘carrier-grade’ that runs push-to-talk over cellular. The top software company in the world for this was called Kodiak Networks. I say “was” because Motorola Solutions purchased Kodiak Networks a year ago. With the software in place Motorola just needs the hardware. Guess which push-to-talk cellular hardware is already compatible with the Kodiak software? That’s right. It is Siyata Mobile’s hardware. And guess which company Motorola Solutions just partnered with to launch a 4G cellular push-to-talk fleet communicator solution in Israel? Yes, that’s right again. It is Siyata Mobile. Motorola can choose to defend its push-to-talk business by purchasing hardware from Siyata and then selling it to its customers. But by doing that Motorola has to eat the fat profit margins that Siyata receives for every device sold. Wouldn’t the better business decision for Motorola be to stop having to pay that margin and instead just buy Siyata, sell the hardware directly to the customer and keep the margin for itself? Price isn’t an object for Motorola. This is the case of a really big fish eating a small fry. Motorola can afford to pay a huge premium to get this deal done. Which is a good thing for Motorola because Siyata’s stock has a looming catalyst that could have a big impact on the company. The fact that Motorola and Siyata are already doing business tells you the clock has started here… and with 12-14 million devices that need to transition quickly from LMR to push-to-talk over cellular. With Tier 1 cellular carriers already signed on, Siyata would have the inside track on all of them. If Motorola wants to continue to be a key part of this industry, they have to buy out Siyata. There is nobody else to supply those 14 million customers. What’s 14 million trucks x $1,000/phone x 45% margin? It’s US$6.3 billion in gross profit from Siyata’s hardware, that’s what it is. But let’s be extremely conservative. Actually, let’s say I’m completely wrong and Siyata does not get bought out next year. 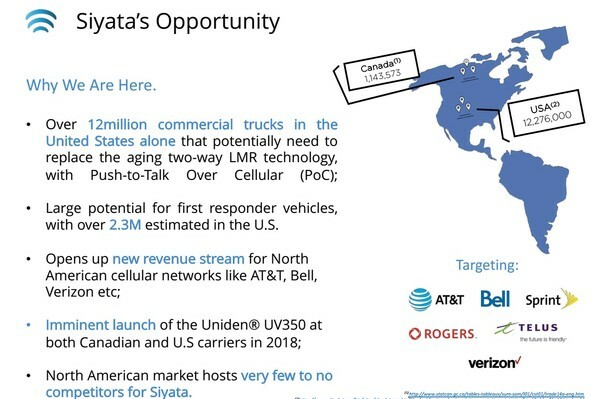 Assume that in the early years in transitioning from LMR to cellular, Siyata is only able to sell 100,000 devices a year; less than 1% of the total market. With 100,000 device sales Siyata will do more than $100 million in revenue and generate almost $40 million in EBITDA thanks to their fat gross margins. That means that assuming just a tiny, tiny market share results in Siyata generating EBITDA equal to the company’s entire current market capitalization. A valuation of 6 or 7 times EBITDA would be perfectly normal for a business like this…so that tells you where I think the stock can go if it’s trading just 1x my bullish 2019 EBITDA idea. Siyata has already launched with the giant cell carrier Bell in Canada. Siyata management has openly said they’re close to similar contracts with massive American cell companies. In fact the company announced a supply agreement with a “Tier 1 cellular carrier” just last week! Think what that means. The giant cell carriers are going to be pushing Siyata’s product for them. These giant selling machines are going to be doing all the work for Siyata which will drive Siyata’s revenue higher. A microcap company with a $100 billion sales force! I’d wager that no company of this size has ever had such a marketing machine working for it. That is why I believe the first announcement of an agreement between Siyata and a U.S. cell company would send Siyata’s stock price soaring. The market will immediately recognize what such a deal will mean for revenue. That is what is ramping up the pressure on Motorola to act. That’s why I’m long several hundred thousand shares. Next post: Are You Positioned For A Big Bounce In Oil Stocks?